The ministry of public security has set up a website with pictures of some of those kidnapped, in the hope of returning them to their families. The ministry website has pictures of 60 children, ranging from babies to young adults, who were kidnapped from their families. 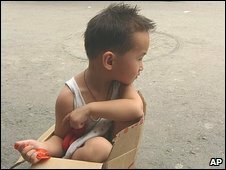 Hundreds, perhaps thousands, of children go missing in China each year. The 2,008 rescued children come from across China, and some have already been reunited with their parents. 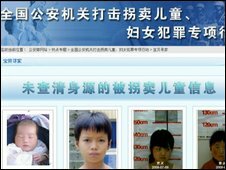 Some of the older children on the "Babies Looking for Home" website were kidnapped years ago, according to the Ministry of Public Security. Criminal gangs steal the children and sell them to childless couples. State media have reported a string of arrests in recent months, including 42 suspects picked up last week for allegedly selling 52 children in the north of China. In China's patriarchal society, baby boys are especially prized, sometimes selling for as much as $6,000 (£3,670), says the BBC's Quentin Sommerville in Beijing. Girls are sometimes sold for just $500 (£305), he says. Children of poor farmers or migrant workers are often targeted. The parents of such children have complained in the past of official indifference to their plight. Human trafficking is seen as a growing problem in China. Some families buy trafficked women or children to use as extra labour or household servants. There have been several high-profile cases of abducted children being rescued from mines and brick kilns. Increased wealth and freedom of movement in China have made human trafficking both more profitable and easier, analysts say. Beijing has promised to do more. A national DNA database was set up this year to help trace missing children. Has China's one-child policy worked?